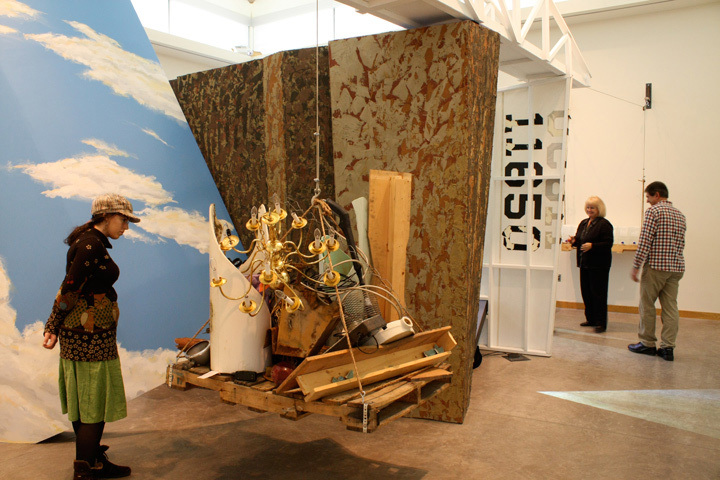 The art form I have been captivated with over the span of my career has been regarded as ‘interactive installation’ art. This means that instead of looking at a piece and deriving meaning the viewer engages the work through walking, sitting, standing, viewing, hearing, and responding to space. Visual, aural, and kinesthetic perception are the means of stimulating response. One of the highest compliments I have received has come through an architect who dubbed it ‘pure architecture.’ These pieces require physical involvement to understand the meanings associated with the structure and to make various metaphorical associations. The forms of the structures are architectural in scale, meaning that a viewer needs to physically navigate walls, passages, doorways, along with slanted floors and walls, color, sound, textures, moving images and different scale within a piece. In essence what the viewer encounters as a result of entering in is a series of experiential metaphors, and meaning is derived through one’s experience. Bridge was created using this kind of vocabulary, requiring physical interaction and a response to a video projected onto the surface of a sail at an oblique angle. This video with the sound and image of a cascading waterfall transitioning to a babbling brook was an important part of the installation. The experience of moving through Bridge is thus supported by the constant sound of moving water. 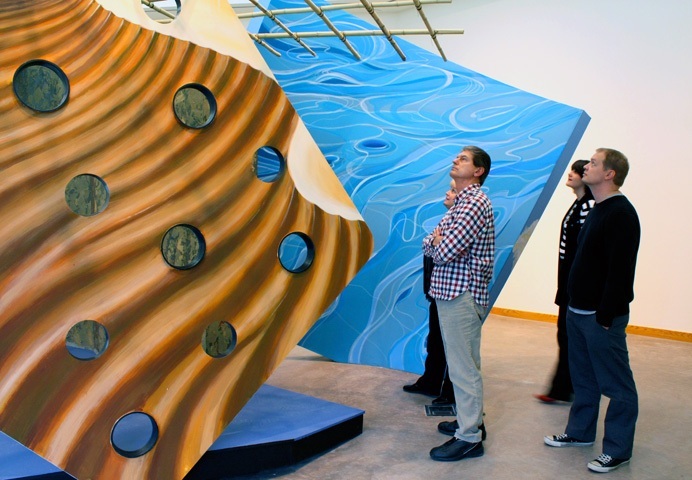 As one moves around the piece one encounters visual representations of clouds, stylized water and desert. The viewer comes to a platform that is slanted, allowing one to come inside the piece while putting one’s body in slight tension. 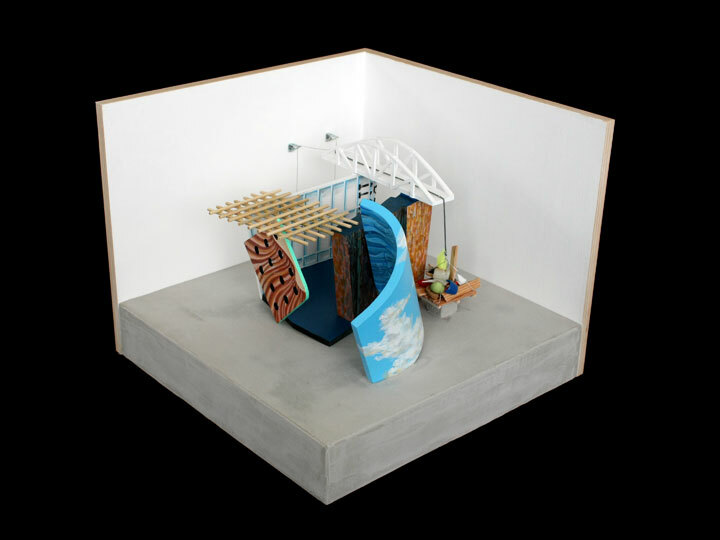 Surrounded by texture and color associated with water environments, the viewer looks up to the bridge, which supports a palette of broken objects counterbalanced by seven jugs of drinking water suspended by pulleys and cables. These contrasts between vapor, water, desert, along with the physical sensations and responses they produce, generate meanings associated with God’s redemptive work through Christ. It is the contrast between balance and imbalance, peace and fear, security and insecurity that support the bridge, which remains level and is over all of the angled components. Physical, emotional, theological experiences coincide to reveal multiple meanings. Bridge came about as a result of having a number of encounters with water in the past year: mist, gentle rain, heavy rain, downpours, babbling brooks, dripping glaciers, mountain streams, raging waterfalls, torrential rivers, giant rivers, inlets, fjords, oceans, tides, crashing waves. They all have their places, sounds, smells and affects. For some water can represent danger and bring on fear – downpours, rising rivers, floods and flash floods. For others water can be life-giving, recreational and relaxing. Then there are associations with water’s abundant meanings: river of life, nourishing water, living water, water for baptism, water for purification, symbolic water or holy water. When a tree falls across a creek in the mountains, it sometimes falls perpendicular to the direction of the creek or stream and creates a bridge from one side to the other. Animals and humans use these apparent accidents to get from one bank to the other. Bridges are transition devices, they are connectors. Natural or man-made they act to allow greater movement and serve to link two sides that may have been impassible without them. Bridges usually serve a purpose, but they can be symbolic and strategic. Some bridges serve as symbols for cities, such as the Golden Gate bridge in San Francisco or the Lions Gate bridge in Vancouver. Smaller bridges take on different associations. A simple foot-bridge across a stream or a rope bridge high across a raging river can take on higher meaning due to its context. It is these links, these transitions, these connectors that may be feats of engineering, aesthetic monuments, or simply functional devices that expand our options. This installation works with water as the context and a bridge as a metaphor. Weights, counter weights, associations with textures, materials, proportions, color, sound, position in space all contribute to a larger awareness of these things in our lives. Christians readily identify with the metaphor of the bridge. As we enter the new year, the good news is that we can trust walking across bridges and know that there is deep meaningful support that goes beyond our limited sense of reality. 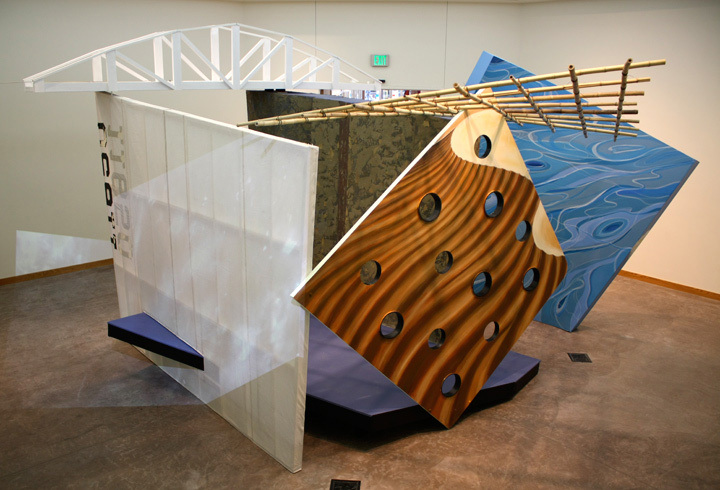 Roger Feldman, Bridge, 2010-2011, Whitworth University, Spokane, WA; Maquette for Bridge, 2011. Click here to watch a short documentary about Roger Feldman and the creation of an art installation in the grounds of Freswick Castle, Scotland.